Microsoft’s new backwards compatibility system for Xbox One is a young and imperfect service. With some of its highest-profile games, including Halo Reach and Gears of War 3, running worse on the current generation console than it did on the Xbox 360. But that hasn’t stopped Xbox gamers from clamoring for some hot new titles for the service. Microsoft has a user feedback site where they allow their gamers to vote on the games they’d like to see on their shiny new Xbox Ones. It’s a great way to signal to publishers like EA and Activision that people actually want to play their old games. And boy have people been signaling for one game in particular. The most demanded game as voted on by gamers is Call of Duty: Black Ops II, and by a pretty wide margin. With 144,000 votes, it stands a full head above the second favorite, The Elder Scrolls: Skyrim, by over 12,000 votes. Each account can only vote once per game, so it’s clear that a ton of people want to play the best game to come out of Treyarch. Will Activision take the hint and port Black Ops II to the Xbox One? Maybe… But they’re sure going at it in a roundabout way. 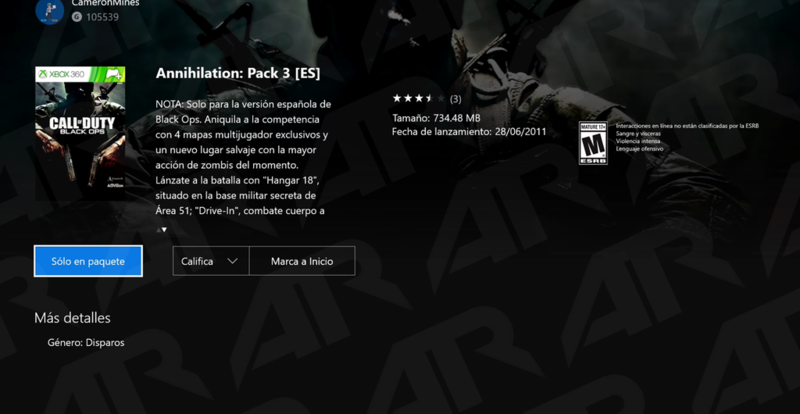 As discovered by Reddit user iAMA_Leb_AMA, DLC for the first Call of Duty: Black Ops has appeared in the Spanish Xbox One store, hinting that the game’s release to the Backwards Compatibility pool is coming quite soon. Black Ops, which comes in at just under 97,000 votes on Micorsoft’s user feedback forumn, is still a highly demanded game, so it’s a good bet that Activision is using the game as a litmus test to see if they should expand their backwards compatibility offerings. If new digital game and DLC sales of Black Ops hit a certain level, chances are Activision will see dollar signs and decide to go all with other titles, which ought to include their most popular shooter, Black Ops II.